Man, I love this split pea soup. It so rarely gets cold here in So Cal to serve up hot soup, but today is a heater-on-window-closed- soup-type-of-day. I’m in! Are you? I love to use split peas because they don’t require “soaking” before cooking like most beans. And if you use a rich vegetable broth or vegetable bouillon to make this soup, like I did. You won’t miss the ham either. Serve it with a side salad or a thick piece of whole grain toast. Okay, I gotta go eat now. What’s your favorite soup? Leave me a link. 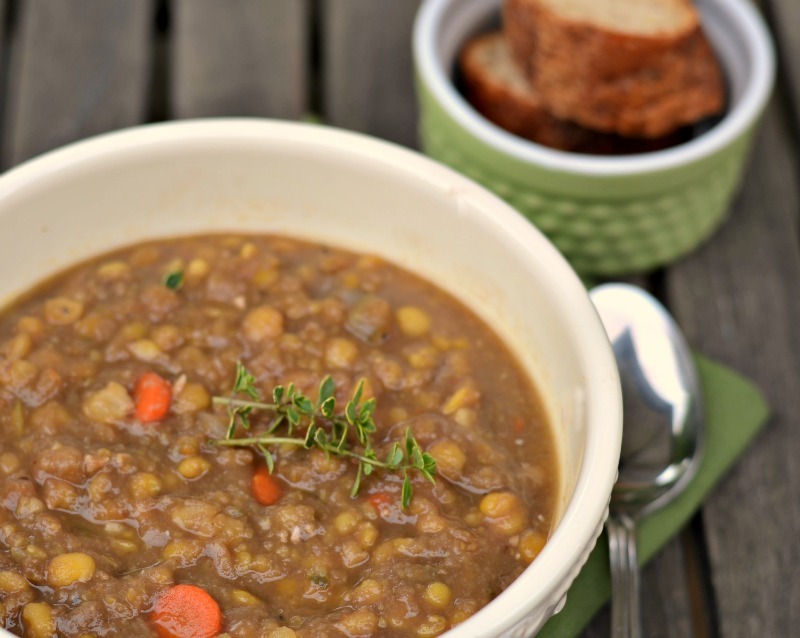 This is a vegan (no ham) version of split pea soup. I promise you won't miss the ham. The secret is to use a good quality vegetable broth or bouillon.Fresh thyme adds to the flavor and aroma. Notes: There is no salt in this rесipе – the veggie broth stock or bouillon does а niсе job of sеаsoning this soup. Taste the soup when you are stirring in the vinegar, add some salt if it needs it then. The vinegar is optional – I think it brings out the flavors. In a large stock pot, add the oil and sauce the carrots, celery and onion until limp. About 5 minutes. Now add the garlic and sauté for 30 seconds. Next add the split peas, bay leaf, thyme, pepper, water or vegetable broth to the pot. I like to use a vegetable base bouillon called “Better than Bouillon” with water. It never fails me. Bring to a boil and simmer for one hour or until the peas get kinda mushy. Add more water if it gets too thick. Right before serving, add the vinegar and taste it. Season with salt if needed.